“Alpha Pact” picked up right where last week’s breathtaking episode left off, with Scott and his mother gone and everyone else reconvening in the hospital parking lot. After literally slapping an unconscious Derek awake, Stiles sent him off to find Cora and run, then opted to remain at the hospital to delay the cops; the Argents found Isaac alone (Peter ran off after spotting the hunting duo), and Derek filled the trio in on Scott and his mother’s whereabouts. With everyone up to speed, the real fun began: a new character came to town, allegiances shifted, budding relationships developed, and several major characters chose to sacrifice themselves to save their families. As a penultimate episode, “Alpha Pact” did an excellent job setting up the midseason finale without skimping on heavy character moments. So, let’s talk about it! As Stiles quickly learned via an FBI agent he not only recognized, but also did NOT appear happy to see, someone had written “Argent” on the hospital’s elevator doors. The message was either a threat or a warning, depending on who wrote it, but no one needed to know the deliverer’s identity to understand Mr. Argent was the last guardian on the Darach’s hit list. 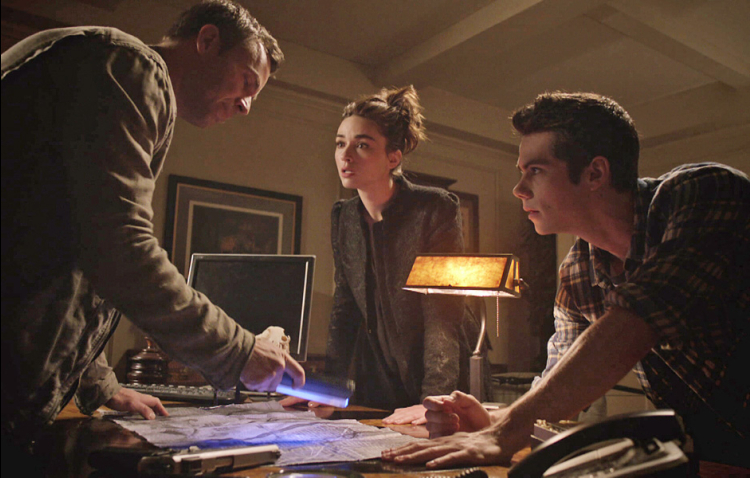 Stiles immediately ran to the Argents with the news, and they pieced together a plan to attack the Darach. Isaac, after a one-sided screaming match at Derek’s (where he ultimately asked Derek why he’d turned the members of his pack, and Derek copped up to his loneliness), stopped by to help. After sending Stiles to find Lydia AKA Beacon Hills’s resident banshee/death detector, Mr. Argent took Allison and Isaac to the bank under the guise that Jennifer would return to the site of a failed sacrifice for a do-over. But, Mr. Argent had no intention of fighting the Darach–instead, he shocked Isaac to the ground and handcuffed Allison to the bank’s guard rails before tossing his beloved gun aside and sacrificing himself to a very pleased evil Druid. Once Isaac contacted Stiles with the bad news, Stiles immediately began to have a panic attack in the middle of the school hallway. To calm him down, Lydia dragged him into the empty locker room and tried to make him think happy thoughts; when this failed, she kissed him. Unsurprisingly, her plan worked, and newly-calm Stiles realized they needed to find Ms. Morell. Though the guidance counselor herself was missing, Stiles searched her office and pulled out Lydia’s file. Inside was one of Lydia’s tree sketches, which Stiles noticed was identical to every single tree sketch Lydia’d been doodling in class. By flipping the tree over, the picture represented roots, and Stiles smartly deduced where the guardians were being held. Unfortunately, all attempts to find the location of the root cellar fell through–Lydia found Derek (and ran into Peter, resulting in a tense stare down that ended with Peter looking uncharacteristically ashamed), but his memory of the location had been wiped by his mother Talia after his and Peter’s tragic experiences there; Stiles drew a blank with Allison, whose grandfather had long ago forgotten the cellar’s location. With the help of Deaton (who’d rescued Stiles from more FBI questioning), Stiles, Allison, and Isaac came up with a plan, but they needed Scott. Meanwhile, Ms. Morell was running for her life through the woods as the pack of Alphas chased her. 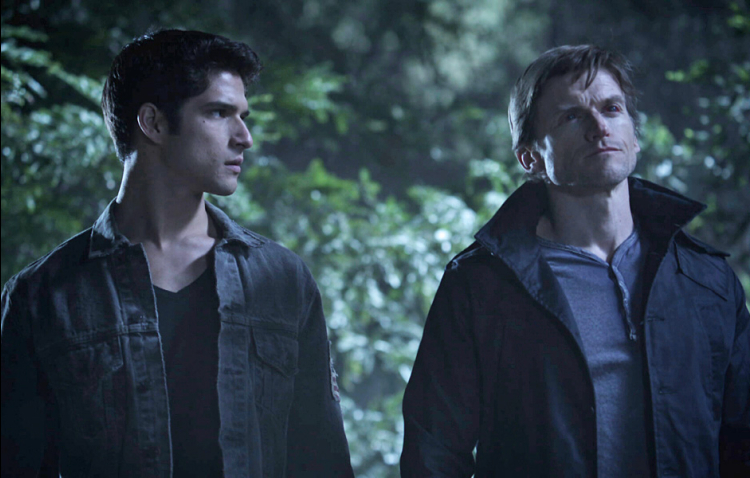 Scott and the Deucalion were there, too, discussing the Darach. Deucalion confessed he wasn’t scared of the Darach, but concerned–anyone willing to kill so many innocent people for her cause was somebody who shouldn’t be underestimated. When Scott asked about the Deucalion’s stance on murder, the Deucalion responded with this chilling line: “I’ll kill any living thing that gets in my way.” So, this battle between the Deucalion and the Darach ought to be semi-exciting, right? Anyway, Ms. Morell trapped herself in a circle of mountain ash while the Alphas and Scott surrounded her. The Deucalion wanted Ms. Morell dead because she was so similar to the Darach, and he was distrustful of her, especially after she sent the girl (from the premiere!) to rescue Isaac from the twins. Then, Ms. Morell began to call the Deucalion out on his lies (especially about Ennis, which definitely piqued Kali’s interest), and he responded by throwing his spear/walking stick through her chest. Scott stopped the pack from finishing the kill and asked Ms. Morell where the guardians were. Later, Scott met up secretly with Deaton and Stiles in the woods, and Deaton revealed his plan: the kids of the guardians would act as surrogate sacrifices for their parents. Though Deaton believes he can bring the kids back, the plan is still dangerous; if they succeed, the Special Druid Tree will have more power than it’s had in years, and the trio will carry a mark (like a darkness around their hearts, as Deaton put it) with them for the rest of their lives. Oh, and the tree will act as a beacon to all supernatural creatures. Of course the three teens agreed to this almost immediately, and Deaton brought them to ice-filled basins in his veterinarian building. Each teen sacrifice needed someone they were emotionally bonded with to push them beneath the water, as well as draw them back to life–Lydia attempted to go to Allison, but Deaton, correctly assessing a bond that the pair probably haven’t even admitted to themselves yet, sent her to Stiles. Isaac went to Allison and Deaton to Scott. 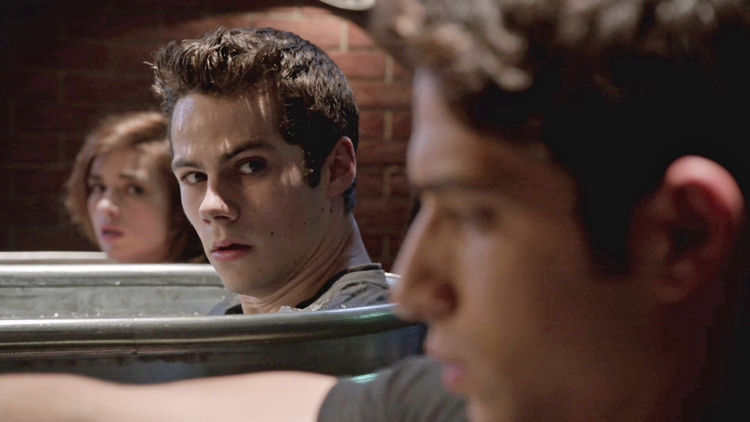 Moments before their heads were shoved under the icy water, Stiles informed Scott his father was back in town. That’s right, the FBI agent Stiles seems to hate? He’s SCOTT’S FATHER. Such a good development, seriously. Anyway, under the water they went, and Scott’s eyes opened to reveal a lovely shade of True Alpha gold. Having spent most of the episode fairly removed from the action, Derek and Peter sussed out a potential cure for Cora. It involved Derek sacrificing his Alpha status so Cora could use the extra spark of magic/power Alphas have to live. Though Derek definitely reverted to a blue-eyed beta (which Peter looked very pleased about), Cora’s fate remains up in the air. Also, despite being stripped of every one of his weapons, Mr. Argent still had his sonic werewolf alarm; he pressed the button, hoping the wolves would be clued in to the guardians’ location. And that’s it! Next week’s the midseason finale, and it looks like a werewolf-blocking lunar eclipse will be creating havoc for the wolves. Should be fun! –As Peter pointed out to Derek, Isaac’s pretty much completely Team Scott now. And the Deucalion’s pack still seems to slowly be splintering, especially after Ms. Morell cast doubt upon the Deucalion’s past actions. –Sheriff Stilinski’s a true believer now–Mama McCall filled him in on the town’s supernatural intricacies (including Mr. Argent’s werewolf hunter status); in a heartbreaking moment, he confessed that not believing in the past had led to him missing his wife’s death when an injured girl buried under a car pileup told him to hurry to his wife, but he didn’t believe in her abilities and chose to stay with the dying girl. This entry was posted in Teen Wolf, Television and tagged Allison Argent, Derek Hale, Deucalion, MTV, Scott McCall, Stiles Stilinski, Teen Wolf, Television. Bookmark the permalink. ← ‘Pretty Little Liars’ S4E9 Recap: Happy Birthday, Emily?